Dust and pet hair inside your laptop and desktops can cause a lot of problems including motherboard overheating, disrupt the air-flow in your system, and deteriorate component connections. When dust gathers on your fans and heatsinks, it can shorten the lifespan of your fan/ components and eventually burn them out or cause costly repairs. As part of the regular maintenance of your computer we would recommend getting your system cleaned once every 6 months. You can purchase compressed air from your local electronics store. Pricing is typically about $8-$15 for a 3 pack, or if you are in the neighborhood, just drop by for our free service. We provide professional dusting for all of our customers. Unlike most of our competitors, our diagnostics are completed in-house by technicians with a minimum of 8-10 years of real-world experience and are generally about 35%-65% lower than our competitors at those big chain stores.. We are very thorough in our diagnostics so we can determine what is the exact cause of your computer's malfunction and the best repair option. We always stay in touch with our clients, and only complete repairs after we have received confirmation to move forward. Diagnostics are necessary to determine the overall health of your computer, and determine if there are any underlying repairs on your computer that need be addressed. Sometimes what may seem to be a virus, can be as simple as a quick optimization/maintenance boost or as severe as a failing hard drive. We offer the lowest prices on laptop LCD screen replacements. We also offer the price match plus guarantee, if you find a lower price we will match it or beat any price to save you money. After our assessment we can let you know what your recovery options are and the best way to proceed. Virus and Spyware attacks have grown tremendously in the last year; now a multi-billion dollar industry! Do not ever provide your credit card information to any anti-virus/ anti-spyware program if you are infected. This simply is a ploy to steal your credit card information. Simply call us, and we can take care of your computer infections. 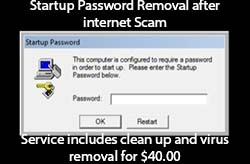 As long as there are no pre-existing problems** on your computer, we are able to remove almost all virus, spyware and fake anti-virus programs within one to three hours. In some rare cases, when a virus has severely damaged your computer or laptop, we may recommend a system restage. Our highly-skilled computer technicians can determine this after we have assessed the extent of the infection(s). If you find a series of pop-ups overwhelming your computer, adult websites redirects, or speculate a virus or fake anti-virus program is beginning to take hold of your computer, Shut Down your Computer immediately and contact us to prevent any further infections / additional costs. We are here to help you with the most cost-effective solutions to get you back on track and back to your work! 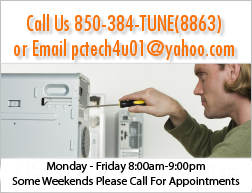 **If our technician finds an underlying/ pre-existing problem with your computer that needs to be addressed first, a diagnostics will be necessary to determine the problem and costs prior to a virus removal. Professional System Dusting, inside components/ fans etc. When a System Restore is performed on your laptop or desktop computer, your entire hard drive is whiped clean to your manufacturer's factory settings. It is recommended that you always back up your work prior to ANY repairs or work is performed on your computer. We can offer you the peace of mind by allowing us backup and transfer your files before and after a system restore. This includes all of your Pictures, Music, Outlook Emails, word/excel/powerpoint documents, bookmarks / favorites and any additional files you request. Whether you have lost a few keys on your laptop, have a few keys that are non-functional or simply want to replace your entire laptop keyboard, we offer a flat rate for most laptop keyboard replacements. Our great prices include the keyboard and installation. If you have spilled liquid on your laptop/keyboard, we highly recommend that you first bring your computer in for a full system diagnostics to determine if any additional damage is found. Over time, Windows experiences what we term in the industry as "Windows Rot". As a rule of thumb, it is recommended that your computer be completely reformatted / restored about once every 2-3 years for optimal settings if you haven't kept up with the regular maintenance of your system. Certain strains of computer viruses can cause extensive system damage (in rare cases) that only a factory reset/ reformat would be the most viable solution. We'll setup your computer correctly and efficiently; and explain to you the host of programs and spyware prevention tools to keep your system running fast and clean. We will configure your router properly to access the internet and print to locally to a single printer. Contact us to make sure all available security settings on your router and computers are activated and running. When you go wireless, security and privacy is our main concern!